India has begun the the process of turning off the analogue television signal, with three main cities moving to digital overnight. 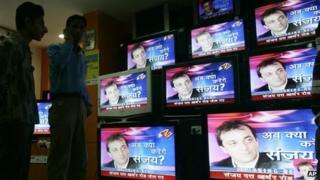 Reports say that cable TV in Delhi, Mumbai and Calcutta switched to digital at midnight on Wednesday. The city of Chennai is expected to follow soon. The change could improve picture quality, boost installation and technology firms. India is one of the world's largest television markets. The country has more than 150 million homes with television, of which 25% have direct-to-home (DTH) service and 51% receive cable TV. A new law - the Cable Television Networks (Regulation) Amendment Bill 2011 - says all cable TV operators must transmit TV signals in an encrypted format through a "digital addressable system" (DAS). This is forcing viewers to switch to either watching television via a set top box from a cable operator or a satellite dish - known as a direct-to-home service. Reports said all TV-owning homes in Mumbai had gone digital, while 95% of homes had moved to the digital system in the capital, Delhi, by Wednesday afternoon. The deadline for the switchover expired at midnight. Calcutta, capital of West Bengal state, is lagging behind with about 17% of cable TV homes yet to move to digital, the reports said. The deadline in Chennai has been extended until Monday as not enough set top boxes were available this week - only 62% of the cable TV homes had installed the boxes by Wednesday, The Hindu newspaper reported. Though the switch to digital - expected to be completed by 2014 - has been widely welcomed, some consumers are not happy, says the BBC's Shilpa Kannan in Delhi. They say set top boxes that cost between $18 and $20 are expensive, and the government has not offered consumers a choice. Supporters of the move say that the switch will mean more content for subscribers. According to the government regulator TV viewers will get a minimum of 100 free channels, at a maximum price of Rs100 ($2). Beyond this, subscribers can access movies and other channels on demand.